The disciple Ananias hurried along the Via Recta through Damascus to the house of a man named Judas, a leading synagogue member. The door opened and the occupant admitted Ananias and then led him through a hallway to a room at the back of the house where he found a young man rapt in prayer. How long had he been this way? Three days, during which time he neither spoke, nor ate, nor drank. So it was true. Here he was, the great Paul of Tarsus, on his knees, exactly as the Lord had revealed to Ananias earlier that evening in a vision. Ananias was a man sent by God; he was also respected in the synagogues, the leader of the Christian community at Damascus, the same group Paul had come to persecute. Word had reached the church that the zealous Pharisee had come to arrest followers of The Way on trumped-up charges of blasphemy and sedition, the same offenses committed by Stephen the deacon, whose recent martyrdom had caused a widespread exodus from Jerusalem to Damascus and Caesarea Philippi. As the writer-theologian Tertullian said: the blood of the martyrs is the seed of Christianity. Ananias accepted the truth. The events that came to pass that night in Damascus were too perfect to be coincidences. He rose in the night and found the house where Paul was holed up. In the vision, the Lord instructed him to receive Paul into the Christian community. Now he found the Tarsinian exactly as the Lord had said and with some misgiving obeyed and went to him. So this was the masterful Paul, the victorious conqueror who was now helpless as a child. The hunter had become the haunted. His companions had led him by the hand into the city where they brought him to Judas as the Lord had commanded. There Paul remained for three days, praying, refusing to eat, entreating the Lord to restore his sight and his speech, and weeping bitterly over Stephen, whose death he helped carry out. Like the blind Tobit, Paul prayed to be forgiven and to be taken into heaven. That night in the house on the Via Recta the human interacted with the divine, for Paul’s encounter with Christ did not happen in a vacuum. Focused, careful, and ongoing formation shaped him for the ministry to which he was called when in that moment Ananias offered him salvation through baptism. Paul was reborn. Paul’s preparation can be broken into phases. The New Testament contains four accounts of his calling: three in the Acts of the Apostles (9:1-9; 22:3-16; 26:2-18) and the saint’s own rendition in his Epistle to the Galatians (1:12-17). That Saint Luke, the author of Acts, would include the episode in his story three times emphasizes its importance. Paul’s inclusion of the event in his letter twenty years later means it remained fresh in his mind and that it continued to drive him to evangelize. 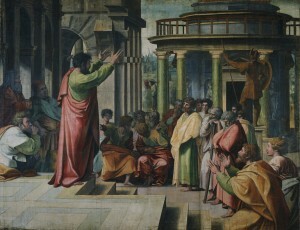 Despite minute variances in the four accounts the truth remains: Paul was chosen by God from before time to proclaim the Word to “gentiles, kings, and Jews,” as Ananias informed him the night his blindness was cured through prayer, Scripture, and the sacraments along with a sincere desire to be forgiven and to forgive. From there it was all or nothing. Paul carried out the mission with consummate involvement, making himself a living sacrifice for the praise and glory of God’s name and the good of his holy Church. In gratitude and thanksgiving for the mercy that he received at the hands of Ananias, Paul offered himself as a living sacrifice, through a renewal of his mind, that he could continually discern what was the will of God for his ministry and for his life. He never wanted to forget these moments. At Judas’s house Paul woke from his sleep of death to the light of life, awakened by the unfamiliar voice of a man standing over him ready to welcome him into the Church — the Church he tried to destroy — that he might accept the truth and be useful to Christ. “Saul, my brother,” Ananias said. “The God of our ancestors designated you to know his will, to see the Righteous One, and to hear the sound of his voice; for you will be his witness before all that you have seen and heard. Now, why delay? Rise and have yourself baptized and your sins washed away, calling upon his name .” (Acts 22:13-16). Ananias laid hands on Paul, telling him that he had been sent by the same Jesus whom Paul had seen in his prayer-vision, the same Jesus he had met on his way into the city. At once things like scales fell from Paul’s eyes and he rose and was baptized. The minister traced the sign of the cross on his forehead and touched his lips and his ears, claiming him for Christ and enabling him to receive and to proclaim the Word. That Ananias transmitted Christ’s gift to Paul, amplified by the visions they shared like reflections in a mirror, emphasizes the supernatural origin of the episode and the connection shared by the baptizer and the baptized. Through eternity they were brought together. Paul was born again, cleansed by the waters of baptism that Ananias poured over his head, washed in the blood of the Lamb. This was God’s plan. That Paul prayed so fervently for three days — like Jonah in the whale’s belly; like the Son of Man in the heart of the earth — testifies to the seriousness with which he embraced Christianity. He did not disbelieve the words of Ananias and committed himself the only way he knew how: according to the Shema: You shall love the Lord your God with all your mind, all your heart, all your soul, and all your strength. Devout Jews like Ananias and Paul prayed the Schema three times each day. The Law also says: You shall love your neighbor as you love yourself. Paul now understood very clearly what that meant, for he had receive the love of Christ who laid down his life for his friends. You are my friends if you do what I command you, the Lord said. Paul and Ananias were Jesus’s friends. This all took place outside of time in the planning and within the world and its limitations in its execution. In the Bible Paul can be seen as an explosive leader who unhesitatingly spent every waking moment proclaiming the Gospel. Certainly he did. Yet there is a depth to his discernment and the pauses and spaces between his letters that are shaped and supported by the historical-theological details in Acts tell us much about the five-dimensional enigma — body, mind, heart, soul, and spirit — that is Paul of Tarsus. To fail to see the man in full reduces him to a flat character in a fable running to and from God over fear of the loss of his livelihood or his soul. The steady and persistent tone of his prose however illustrates that it was written by the hand of a spiritual master with the aplomb of a Greek hero, in control over his ability to relinquish control. A slave of Christ Jesus, yes, but a living sacrifice of praise who trusted that what had been spoken through Ananias was true. The transformation of Paul during the first half of his life happened day by day, in ways great and small, contingent on Paul’s ever-deepening relationship with the Trinity through his apostolic labors. A review of his life shows how God was preparing him for the ministry from before the saint’s birth, as were all the great covenantal prophets. He was born into the world when, where, and how God wanted him to be born. He was reared in the Hellenistic city of Tarsus and then studied at Jerusalem under the direction of Rabban Gamaliel, the greatest teacher of the Law since Moses. Paul’s commencement from his training coincided with the upheaval in Jerusalem following the resurrection, that is, the mid-30s, and he persecuted the followers of Jesus “even unto foreign cities.” Following Paul’s baptism, a period of solitary discernment, focused and intense, culminated in his acceptance of the commission at the same site where God had handed down the Law to Moses, Mount Sinai. [i] Empowered by this challenge, Paul began his ministry in Damascus where in the synagogues he preached Christ crucified and risen to the astonishment of the Jews who then turned on him — they drove him from Damascus. At great risk he returned to Jerusalem to meet “those who were apostles before him,” only to be shipped back to his native Tarsus where he spent more than a decade in anonymity, preaching quietly in the agora. Then one day the apostle Barnabas walked into Paul’s tentmaking shop and enlisted him for the mission to Antioch and his life changed again. The Church continued to spread. In all the accounts Paul’s calling was related as the call of the Old Testament characters in other parts of God’s story: light, sound, falling to the ground, acceptance of the calling. In Paul’s case, he was called to something greater and more glorious than his heroes, Isaiah, Elijah, the throaty and sensitive Jeremiah. Here a Christian named Ananias received a revelation from Christ who sent him to inform the apostle that he had been drafted into the service of the gospel and of the suffering he would endure for the sake of the Word. Christ spoke to him in Hebrew, the language of their ancestors, calling him by his Hebrew name, anchoring the incident more deeply into the covenant. Despite the frequency of the accounts in the New Testament, no description is given of Jesus in either Paul’s letter to the Galatians or in Acts. Apart from the gospels, the Apocalypse as written by the elder John offers the most vivid and compelling depiction of the glorified post-resurrection Jesus. Then I turned to see whose voice it was that spoke to me, and when I turned, I saw seven gold lampstands and in the midst of the lampstands one like a son of man, wearing an ankle-length robe, with a gold sash around his chest. The hair of his head was as white as white wool or as snow, and his eyes were like a fiery flame. His feet were like polished brass refined in a furnace, and his voice was like the sound of rushing water. In his right hand he held seven stars. A sharp two-edged sword came out of his mouth, and his face shone like the sun at its brightest. When I caught sight of him, I fell down at his feet as though dead. He touched me with his right hand and said, “Do no be afraid. I am the first and the last, the one who lives. Once I was dead but now I am alive — forever and ever” (1:13-17). Had this been the image that Paul saw of the Lord he could never have forgotten it. Why would he want to? It was this revelation and the sound of the Lord’s voice — confirmed by the Spirit he recieved in baptism — that opened his eyes to that same heavenly vision. Every day Paul rose and walked a little further toward that vision, by faith, but also by sight for he longed to see his Master again. 1 Anglican Bible scholar N.T. Wright postulates that Paul, like Elijah and Moses, traveled to Mount Sinai to resign his commission, only to accept his vocation to evangelize as the divine mandate from God. Paul: In Fresh Perspective. Minneapolis, Minn.: Fortress Press, 2009. Next Article Peter as Satan? Fr Cordani, thanks for another great article. You bring to life Paul and his times.